Folk medicine is often considered to be a relic of the past. However, there are still many treatments in use today that have been used by our ancestors for thousands of years. One such treatment, and the one in which I will focus on today, is turmeric. In this post, I’ll introduce turmeric and, more importantly, its main component curcumin. I’ll discuss its uses – both in the past and the present – and explain why many people may believe it is one viable option for the treatment of hair loss. I’ll also show you how you can get started with turmeric supplementation, and the best ways to make its use most effective. Turmeric is a member of the ginger family which is native to India and other South Asian countries. It grows best in wet, tropical climates and is cultivated for both culinary and medicinal purposes (1). The most used part of the plant is the rhizome, or the part of the stem which remains underground as the plant grows. The powdered turmeric spice you find on supermarket shelves is ground from the boiled and dried rhizome. It is famous for its deep yellow color, which is often used as a colorant in condiments such as mustard. 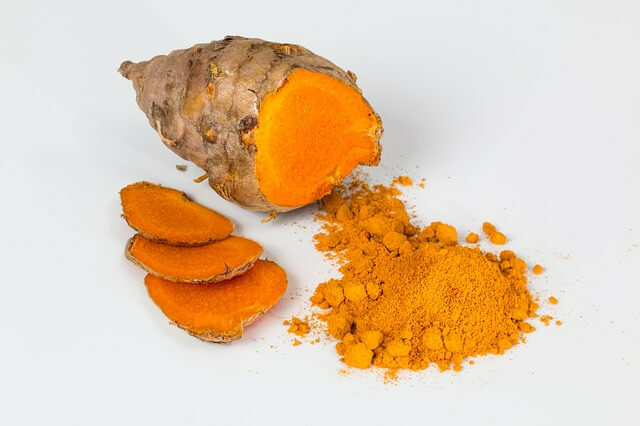 The powder has long enjoyed popularity as a spice in the curries of India, Pakistan, and Bangladesh, thanks to the bitter and peppery taste of its most prominent active ingredient, curcumin. Turmeric has been used for centuries in traditional Indian medicine as a treatment for indigestion and liver problems, and in the healing of wounds (2, 3, 4). Further research is underway to investigate the effect of the plant’s traditional role in the treatment of kidney diseases, cardiovascular ailments, gastrointestinal problems, diabetes, and even cancers (5, 6). But what exactly is it about turmeric that is so beneficial to human health? The plant’s main components are known as curcuminoids, and are comprised of curcumin – as we have already seen – along with demethoxycurcumin and bisdemethoxycurcumin (7). The amount of each compound varies between different plant variations, however, curcumin is the active ingredient and is the compound which has been studied the most. Curcumin is not uniquely found in turmeric, and it can be found in a variety of plants. As a chemical compound it is more properly named diferuloylmethane and is marketed and sold independently of turmeric as a food colorant, flavoring, medicinal supplement, and cosmetic agent. Its chemical classification came long after it had first been used in medicine, and its popular name is derived from the Latin name of the turmeric plant, Curcuma longa. You may also see it on food labels as an additive: E100. Curcumin is not essential for the growth and survival of turmeric, rather it is a natural phenol which defends the plant against herbivores (8). This is a feature it shares with other secondary metabolites which are often used in medicine or as food additives. There is ongoing research into phenolic compounds in general and their role in the treatment of human diseases. Curcumin’s applications in medicine are still limited to traditional forms, despite having undergone laboratory research in numerous studies. Part of this body of research has shown that the compound can be safely administered to humans over a three-month period in daily doses of up to 12mg (9). Part of the laboratory research into curcumin suggest that it may help combat hair loss in a number of ways (10). This research, coupled with the fact that it has been used in traditional medicine for hundreds of years, has led to a surge in marketing of the plant and its compounds. 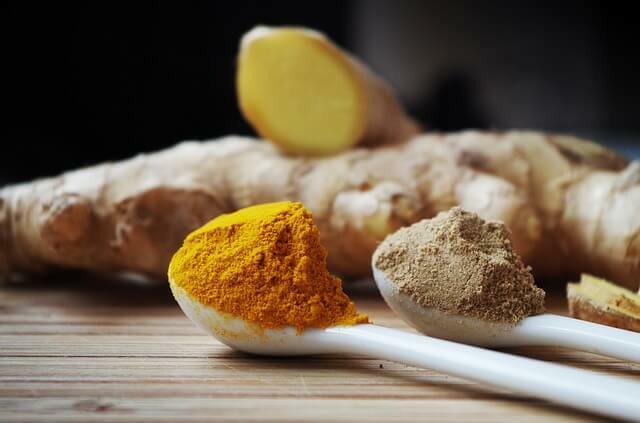 It is typically claimed that adding turmeric to your diet will, over time, give a boost to your body’s overall health and reinforce your immune system (11). This may indirectly help to stimulate hair growth in those who have lost hair due to autoimmune conditions such as androgenic alopecia. Does it Actually Work? What Does the Science Say? Studies carried out in laboratory conditions show that extracts of turmeric show properties in common with synthetic drugs which are used in the treatment of androgenic alopecia. More specifically, finasteride. One of the ways that finasteride works is as a 5-alpha reductase inhibitor, which means it reduces the body’s ability to convert testosterone into dihydrotestosterone (DHT) via the enzyme 5-alpha reductase (5-AR) (12, 13). This is important because 5-AR has been shown to be a main cause of many ailments including prostate cancer and, of course, androgenetic hair loss (14). This hair loss occurs as a result of the damage caused by 5-AR to hair follicles, eventually shutting them down and killing them. Like finasteride, turmeric extracts have also been shown to inhibit the 5-AR enzyme meaning that they could also play a similar role in reducing hair loss (15). This property is believed to belong to the curcumin compound found in the turmeric extracts. Curcumin has been shown to have inhibitory effects on androgens (and, more specifically, DHT) in both 2014 and 2015. 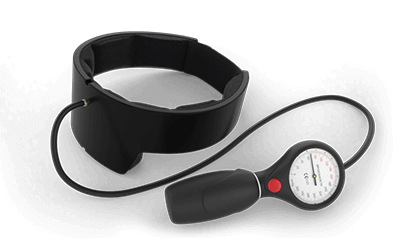 These studies were performed in regards to BPH – another condition in which DHT sensitivity is believed to play a major part (16). These results were supported by a 2018 study performed by researchers from Japan (17). But how does curcumin work to lower DHT levels? As the aforementioned study shows, curcumin supplementation may lead to an increase in the expression of the enzyme Aldo‐Keto reductase 1C2 (AKR1C2). 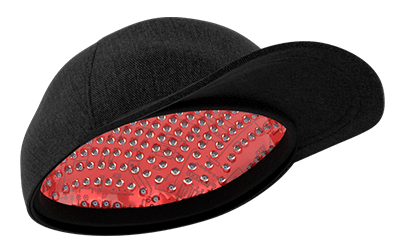 This, as a result, supports the decrease of DHT. Even further, clinical tests have shown that administering daily amounts of curcumin over a period of three months indicate no toxicity, unlike finasteride, which has shown to cause adverse effects including erectile dysfunction and infertility (18, 19). In addition to the enzyme-inhibiting properties that curcumin displays on its own, it has also been shown that it can be combined effectively with minoxidil – the vasodilatory active ingredient in topical and foam treatments for hair loss such as Rogaine (20). These studies involved a relative of turmeric – Curcuma aeruginosa – and showed a significant enhancement in the performance of the synthetic drug in restoring hair growth in male sufferers of androgenic alopecia (21). Another way in which curcumin probably has a positive effect in reducing hair loss and encouraging growth is due to its antioxidant and anti-inflammatory properties, which help the body to heal and recover more easily from conditions that may negatively affect hair follicles and the scalp (22). Underlying conditions such as seborrheic dermatitis may be responsible for hair loss in some cases, and curcumin can help to resolve this (23). A further way in which curcumin can promote hair growth is through its role as an activator of Vitamin D receptor genes in hair follicles (24). These genes help to control the growth cycles of hair, and studies have shown that mice and humans who lack these genes are more likely to suffer from alopecia than their counterparts (25, 26). The only major dietary source of curcumin is turmeric (27). On average, turmeric extracts are made up of around three to four percent of curcumin, although, as we have seen, this can vary. Another spice called shoti (zedoary root) also contains curcumin, and is popularly used in Indian pickles. Turmeric is an essential ingredient in many Indian dishes, and is used to enhance and balance the other flavors in lentil, meat, and vegetable dishes. Turmeric was spread from India to Indonesia by early merchants and missionaries. In Indonesian cuisine, the plant is commonly used in vegetable, meat, and fish dishes, along with red and yellow curries and yellow rice. It is also often found in the dishes of Malaysia and southern Thailand, especially in curry pastes, fish dishes, soups, sauces, and even with grilled fruit such as bananas and coconut. In the West, turmeric is often used for its strong, deep-yellow coloring, which lends itself well to mustard and other sauces. It has slowly become a more widely-used ingredient and is now found in cheeses, sausages, yogurts, pickles and sauces, including Worcestershire sauce. In Japan, turmeric is the main ingredient in a popular drink known as Ukon, which is marketed as having numerous medicinal properties and is popularly drunk by men and women across the country. Similar drinks contain various vitamins and are used as hangover cures. 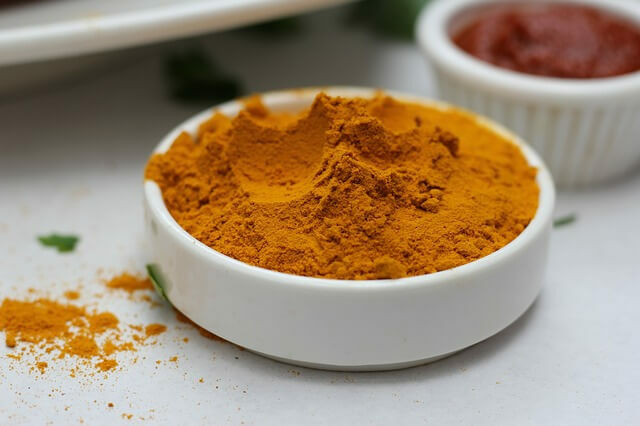 Although turmeric occurs naturally and is used in a wide range of recipes, many people find that the best way to guarantee their daily dose of curcumin is through supplementation. There is, however, currently no consensus on what the best way to take a supplement would be, nor on how much should be taken in order to see any benefits. It is likely that the appropriate dosage would vary from one individual to another. As with many supplements, the body struggles to absorb curcumin on its own (28). There is no point in swallowing it with water, as it is not water-soluble, and would simply pass through the body without having any significant effect. Mixing curcumin with fat, however, has the opposite effect – the body is able to more fully absorb the curcumin which would otherwise have slipped by (29). This suggests that a food-based intake of turmeric would trump the benefits of almost all supplements. Nonetheless, adding turmeric to meals or taking it as a supplement will likely have demonstrable health benefits. Another way to increase the bio-availability of turmeric is to take it with piperine, which can drastically (up to 2000 percent!) increase the amount that gets into the bloodstream (30). There is little doubt that turmeric, especially its active compound curcumin, has tangible health benefits for humans. For sufferers of hair loss, it is especially interesting due to its nature as an androgen inhibitor, meaning it has the same effect on alopecia as the synthetic drug finasteride, yet it isn’t associated with the negative side effects of that drug. 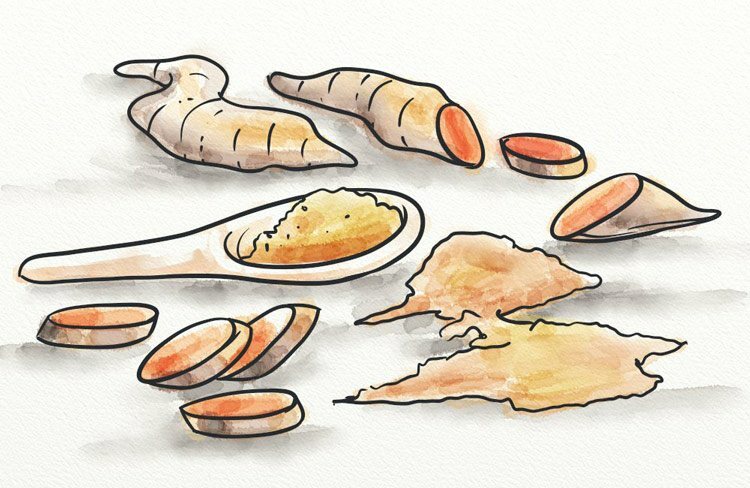 How you decide to take turmeric is up to you – as we have seen, there is currently no consensus on what is the best way or the right dosage. You can, however, be confident that there is little chance of taking too much. I had hair loss for years and I spent lots of money in products to stop the hair loss. After taking turmeric pills I notice my hair not falling anymore. I think it is because the use of turmeric. Also, my back pain was reduced to about 80%. It was only after about 4-5 days!!! Hello Maria, this is great to hear. Thanks for sharing your experience. Would it be ok to take a turmuric supplement together with a hair loss supplement that contain ingredients such as saw palmetto, beta sitosterol, pygeum bark and stinging nettle to name a few? Hi Deniz, I don’t see anything wrong with that. Make sure you get a high quality source and take the right amount and you should be fine. Hi Khalid, this is an interesting question. But it’s not something I’ve looked into much. Adjusting your diet according to your metabolic type is quite important though. There are articles out there that claim Turmeric is one of the best ingredients to use at home for hair removal, not only as a mechanical means, by creating a paste and the ability of the particle to attach to hair follicles, but also the fact that with time it helps thinning the hair and kills the root. How can the science be so divided and what is the final verdict? Hi Marsel, I haven’t heard about this before. It certainly warrants some further investigation. For now I would stick to using turmeric internally. Thanks, I haven’t looked at this study specifically. I’ll take a look when I have a moment. Thanks for sharing.